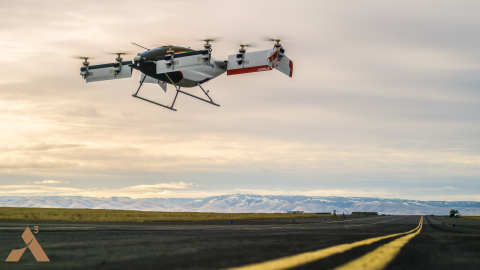 PENDLETON, Ore.--(BUSINESS WIRE)--Vahana, the all electric, self-piloted, VTOL aircraft from A³ by Airbus, today announced the successful completion of its first full-scale flight test, reaching a height of 5 meters (16 feet) before descending safely. The test was completed at 8:52AM Pacific on January 31, 2018 at the Pendleton UAS Range in Pendleton, Oregon. Its first flight, with a duration of 53 seconds, was fully self-piloted and the vehicle completed a second flight the following day. Vahana, the Self-Piloted, eVTOL aircraft from A³ by Airbus, Successfully Completes First Full-Scale Test Flight.